In an increasingly complex world, many leaders are ill equipped in leading and engaging people through the arising challenges. Learn how to become a grounded leader with the confidence, conviction, tools and motivation that will inspire people to follow you. Our Integral+Leadership™ Practitioner program is about creating self-managed, self-actualising leaders; first with themselves, and then their teams and organisations. You will learn new tools, skills and ways to communicate that unleash your scope of influence, so you can achieve significantly different performance results, whilst becoming an enlightened leader, who is able to lead without ego or attachment. This program is for all leaders (present and future) whether you want to lead yourself, your team or organisation or clients. "The Coaching Room became involved in training and coaching like we had never experienced before, and 100+ employees from across all levels and sections of Council experienced the unique techniques required to get staff thinking and changing the way that we worked together - the change has been astounding - we have taken the 1st steps on our journey of change." The Integral+Leadership™ Practitioner program provides a leadership framework (a map) for giving Leaders simple, yet profound perspectives. This course helps unlock the capacities and innate wisdom of the leader, needed to lead themselves, their followers, industry and the stakeholders of today, effectively and successfully into a vibrant and flourishing tomorrow. At last a map, the map, that truly charts the territory of individual, team and organisational leadership, issues and solutions! 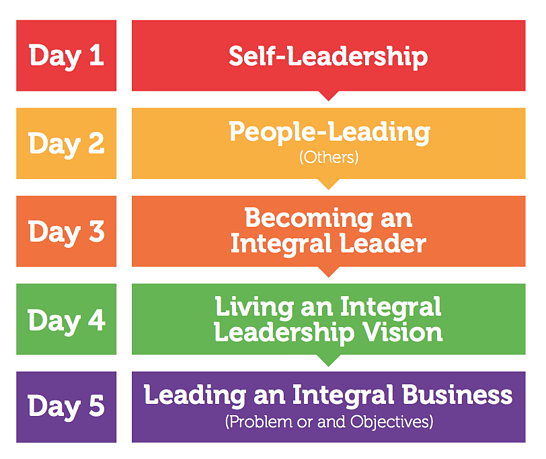 Based on Integral Theory (Ken Wilber et al - an all-inclusive mesh that draws on the key insights of the world’s great knowledge traditions) Integral+Leadership™ utilises a single developmental model; The 4-Quadrants, across all 5 days of this program. Making the learning simple, deep and embodied. The wisdom gained from drawing on ‘all truths’ and ‘all perspectives’ of The 4 Quadrants, allows the Integrally informed leader to bring new depth, clarity and heart to every level of human and business problem and opportunity - from unlocking individual and team potential to finding different approaches to cultural, organisational and global-scale problems. Integral Theory suggests that all human knowledge and experience can be placed in a four-quadrant grid (The 4-Quadrants), along the axes of “interior-exterior” and “individual-collective”. It offers some of the most comprehensive approaches to reality, to explain how academic and organisational disciplines are brought together and every form of knowledge and experience fit together coherently. Our Integral+Leadership™ Practitioner program awakens and integrates all leadership and organisational development theories on one single page. Moving from coping to managing to leading, through situational leading, often rests in active and reactive strategies and behaviours. Our Integral+Leadership™ Practitioner program offers the power and agility of contextual leadership that is not dependent on reactivity or the situation. The contexts, multiple-perspectives and distinctions shared via the Quadrants across this program, provide a living and comprehensive wisdom, once learnt and practiced, seems alchemistic. As the day unfolds, after the initial foundational learnings of the 4 Quadrants are shared, an in-depth exploration of the subjective experience of the Leader and a review and study of real or behavioural and communicative aspects of the Leader occur. Delivered through the quadrants in an effort and intention for creating significant self-awareness, enabling new and different perspectives and responses to be chosen and practised. The dynamic utilised in this day is one of a developmental awakening from the Leader being subject to their current perspectives attitudes and patterns of personality and reactivity; toward greater objectivity leading to a broader range of capacities and responses. This process also covertly starts to facilitate and educate the individual Leaders toward a more systemic and integrally informed world-view. Using developmental action inquiry (DAI- Torbert) the day is wrapped up in formulating several core intentions, for post-workshop engagement leading to realising and becoming a more Integral Leader of Self. The end of accepting the term and norm of ‘culture change’ by working directly upon culture and instead, awakening to the leverage of the 4 Quadrants to lead ‘culture evolution’ through an integral and whole of reality response that impacts and directs a different organisational culture to emerge. This day we use the 4 Quadrants to identify a Leaders current way of leading. We start by mapping out the current 4 quadrant profile of each Leader. This process is often complicated to start doing (simply because these areas are so close to us) and often brings up concerns and realisations of just how often we are ‘Out-Of-Date’! with our Leadership qualities, perspectives & attitudes and our actions. There is usually quite a void in what we imagine we are like as a leader and how we lead. It is often an eye-opener of a morning with lots of delight and disaster floating around in the room. Leaders start to realise that knowing about the ‘gap and any sense of lack is a delightful opportunity toward becoming a more powerful and inclusive operator! Closing the day, using developmental action inquiry (DAI- Torbert) each Leader formulates several core intentions with strategies, behaviours and evaluation criteria, on realising and actioning the identified ‘different way’ as a Leader for post-workshop engagement leading to understanding and becoming a more Integral-Leader. In today’s current and historical organisation situations, the Leadership or Organisational Vision if often well intended, yet, lacking something for almost every stakeholder. A Leadership vision cannot be 2-pages long; however, that would seem to be what’s needed to keep everyone engaged and happy! With this err of understanding, we often see very complicated, messy and overprivileged Vision statements that are haemorrhaging from multiple locations and places. Organisations and often misdirected and being ‘lead’ by more people ‘wandering’ than Leading in a collaborative, confident and unified way. Closing the day, using developmental action inquiry (DAI- Torbert) each Leader formulates several core intentions with strategies, behaviours and evaluation criteria, on realising and embodying the new or ‘different’ vision as a Leader and how they will engage and inspire their followers, for post-workshop engagement leading to understanding and living a more Integrally informed Leadership vision. The 4 Quadrants is used to layer over these seemingly tricky and challenging business processes to provide greater and more general wisdom and outcomes. We look not only ‘at’ all the possible arising areas for analysis, but we also look ‘as’ the problem or opportunity from ‘as’ it, from the inside looking out. Our Integral+Leadership™ Practitioner public program is delivered in Sydney over 5 days. If you are looking for a corporate (inhouse) program for your Leadership Team please see our Integral+Leadership™ Suite or contact us using the details below. (which includes 3 x one-to-one Executive Coaching sessions with a TCR Executive Coach). As a business and as individuals within The Coaching Room, we realise that we need our clients to be able to be and do what we do to make a massive impact and for you to be at the forefront of the changing face of leadership. And we offer a number of different payment options to make it easy for you.